For the first time since 2010, Elk Grove City Council member Pat Hume will face a challenger for what he hopes will be a record-setting fourth term. In papers recorded on Friday, June 1 with the Elk Grove City Clerk's office, Andres Ramos has filed the necessary documents to indicate he will take on Hume for the city's District 2 seat. Ramos, whose credentials as Democratic party member include being an elector in the 2016 Electoral College, has been active in party politics and has appeared before the Elk Grove City Council on several occasions through the years. His most recent appearance was on Wednesday, March 14 when he and several community advocates urged the city to switch to by-district voting (see video below). 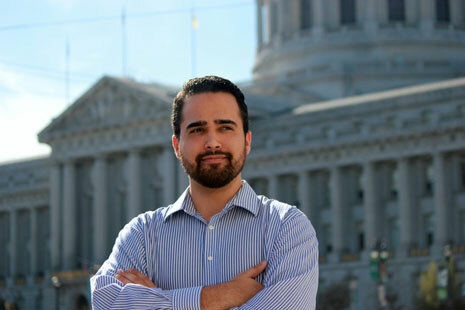 A longtime Elk Grove resident, Ramos is a recent graduate of University of California's Hastings School of Law. Prior to law school, Ramos received a Bachelor's degree in economics from Sacramento State and has twice interned at the California State Assembly and worked as a law clerk with Public Advocates in Sacramento and AFSCME in Washington D.C. Along with his work in the Democratic Party, Ramo also served on Elk Grove's Multicultural Committee. While Elk Grove City Council seats are officially non-partisan, in the last several years it has become increasingly more partisan. Hume is a Republican and generally, sways conservative on a host of issues such as climate change calling portions of it "voodoo science" although he has shown a willingness to stake out more liberal positions on topics such as addressing homelessness having expressed support for the development of a tiny home program in Elk Grove. One election issue that Ramos and Hume will be at loggerheads on is by-district voting. As noted Ramos has framed the current from-district system, where council members area reside in one defined district by elected citywide, as a violation of voting and civil rights, while Hume supports its maintenance. In a message received last night, Ramos said a statement on his candidacy will be issued today. Once that is received, either this story will be updated, or another will be posted.